While all of the Doteasy web hosting plans come with a free 1-year new domain registration, you are certainly welcomed to use an existing domain name on your new Doteasy web hosting account. 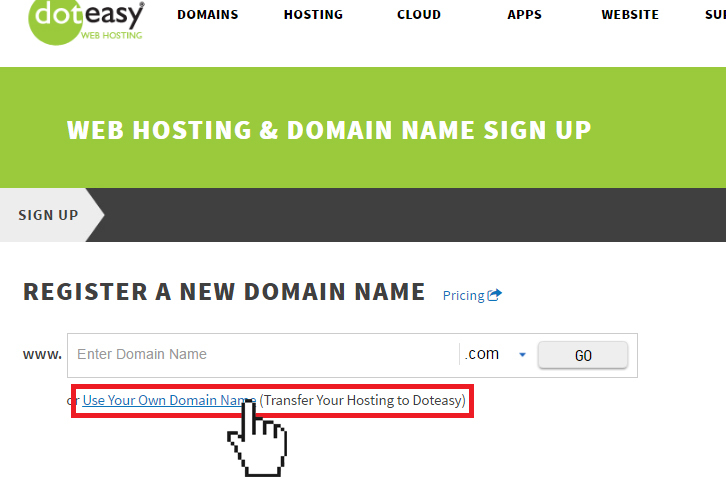 If you already have a domain name registered, you can sign up for a Doteasy Transfer Hosting account. Transfer hosting simply means you are transferring your web hosting service from your previous web host to Doteasy. Your domain registration, on the other hand, remains with the current domain registrar. If you wish to transfer your domain registration to Doteasy as well for management, you will need to submit a separate Transfer Domain request. What is included in my transfer hosting account? Your transfer hosting account will have all the web hosting features of a regular web hosting account. The only difference is, you won’t be able to manage your domain registration through your Doteasy Member Zone – that’s because your domain registration will remain with your current domain registrar. I’ve signed up for a transfer hosting account, what’s the next step? Once you have signed up for a Doteasy transfer hosting account, our system will send you an email containing all the necessary steps (more specifically, the necessary DNS and Domain Technical Contact changes) you need to take to complete the account activation. These changes will act as a notification to your domain registrar that you will be using Doteasy as your domain’s web host. They will then need to update all your domain records to reflect these changes. Why and how do I make the DNS changes? Your domain DNS is simply a file that contains the complete details of all the resources for your domain, including web server, mail server, ftp server, etc. Making DNS changes involves changing your domain’s primary and secondary name servers to that of Doteasy. Your new Doteasy name servers will contain all the details of the Doteasy servers assigned to you. Once you have made the DNS changes, all requests for your domain name will be redirected to your account on the Doteasy servers. Because the primary and secondary name servers are part of your domain registration record, you will need to submit these changes via your domain management panel (ie. your current domain registrar). Login to your domain management panel at your domain registrar (ie. the place where your domain is currently registered with). Once logged in, look for the option to either set your domain’s name servers or change them. Unfortunately, every registrar has a different way of doing this. So if you are unable to locate such option, you will need to contact your domain registrar for further assistance. Once you have found the correct page to change your name servers, you will most likely see a form that lists out your domain records. Look for the fields that let you edit the “Primary Name Server” and “Secondary Name Server” settings. Some registrars may require you to remove the current primary and secondary name servers before adding your new Doteasy name servers. If this is the case, go ahead as instructed. Once you’ve set your name servers, you’re done! But, please allow 24-72 hours for the name server changes to fully propagate and take effect. Why and how do I make the Domain Technical Contact changes? Each domain registered must include contact details. These include the registrant contact, administrative contact, billing contact and technical contact. Generally, the technical contact is the person responsible for the web server on which the domain is hosted. These contact details are entered into a WHOIS database so that the correct person can be contacted if necessary for various reasons. When you change your domain technical contact to Doteasy, you are simply listing Doteasy as the person to contact if there should be any technical matters problems with your domain (ie. your website or your web server). Just like the domain name server changes, you will need to make the Domain Technical Contact changes via your domain management panel.